CULLMAN – The Cullman County Republican Party on Thursday held the last of its community town hall meetings, this one at West Point before a standing-room-only crowd which, after outbursts at the previous meeting at Fairview, included a substantial number of Cullman County Sheriff’s Office (CCSO) personnel. In attendance were several elected officials, including Sen. Paul Bussman, Circuit Judge Martha Williams, County Commissioner Kerry Watson, County Sheriff Matt Gentry, Circuit Clerk Lisa McSwain, County Commissioner Garry Marchman, Revenue Commissioner Barry Willingham, Baileyton Mayor Johnny Dyar and West Point Mayor Kenneth Kilgo. The crowd heard from Bussman and Marchman, whose challengers did not attend the event. As County Probate Judge Tammy Brown did not attend, challenger Carol Berry addressed the crowd alone. Alabama House of Representative challengers Scott Stadthagen and Justin Morrow went head to head in a tame session. A little excitement ensued when the candidates were pressed on the sources of their funding. Morrow stated simply that he had received no funding from liberal sources, while Stadthagen responded that he did not keep track of the political leanings of every person who gave him a check. He assured the questioner that no monetary contribution would change his positions. 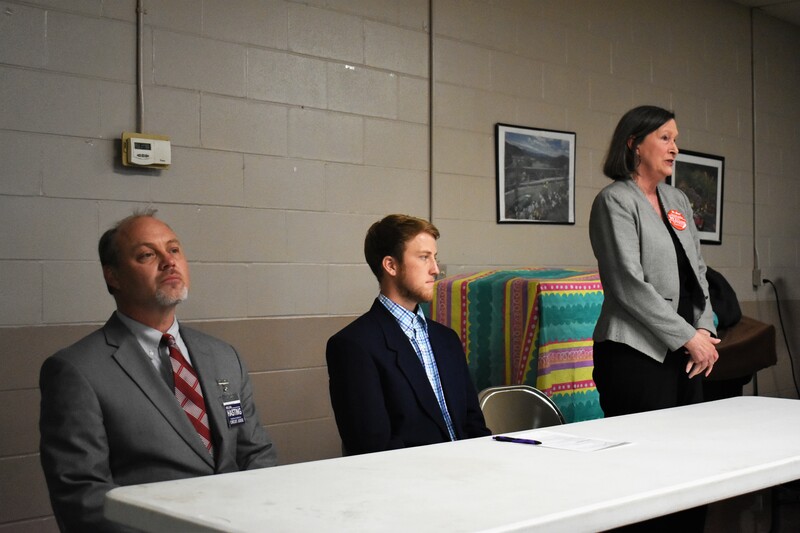 The real excitement of the evening came when incumbent Circuit Judge Martha Williams and challenger Melvin Hasting took the floor. Melvin, who in media advertisements has attacked Williams’ handling of certain cases, cited the “Canons of Judicial Ethics” to claim that he is within his legal right to campaign in that manner, and stated that he would continue to do so. Hasting told the crowd that too many things go on behind closed doors at the circuit court, and that ads he had posted were exposing actions the public needed to know about. Williams spent the question and answer portion fending off verbal attacks from Hasting supporters in the audience, some citing evidence presented against the judge in ads by The Victims Voice PAC in the Community Shopper’s Guide. One supporter was escorted out of the building by Sheriff Gentry and deputies while Williams said that the information in the ads did not present a complete picture of her work. Good afternoon. I just wanted to provide you both information about the West Point Town Forum. The West Point Town Hall Forum was scheduled for Thursday, May 10, 2018. I provided a message that I had a scheduling conflict. My intent was to attend my first meeting and then go to West Point. On the way to the forum I was sent a text that it was over. I want everyone to know the reason I did not attend and it was definitely not intentional.